O.R. Lasertechnologie GmbH, with U.S. offices in Elk Grove Village, IL, develops and builds robot-assisted laser systems for direct metal deposition (DMD), taking the production and repair of sliding bearings to a new level. According to company officials, it’s only necessary to apply a layer of metal a few millimeters thick using the powder nozzle to reliably and cost effectively protect the large shaft bearings used in ships from wear and tear. Enormous container ships crisscrossing the world’s seas require powerful drives: diesel engines with outputs of 108,500 hp and as many as 14 cylinders. The shaft that drives the propeller has a diameter of about 600 mm, weighs to 300 tons, and rotates 84 times/min. The shaft rests inside hydrodynamic bearings subjected to heavy wear because the shaft is in direct contact with, and slides over, the bearing’s surface. A film of lubricant reduces the inevitable friction, but doesn’t develop fully until the oil pressure rises. Especially when engaging or disengaging the shaft, the protective film of oil is not yet or no longer sufficient to prevent direct contact between the surfaces. The affected parts of the bearing are therefore subjected to considerable friction and wear, which significantly reduces their life expectancy. A conventional process to improve wear resistance on the bearings is extremely labor- and cost-intensive, according to O.R. Lasertechnologie officials. But the latest-generation lasers supplied by the company can be used with a powder nozzle for DMD, yielding considerable benefits. The metal alloy is fed in the form of a dry powder via the nozzle coaxially to the laser and melted onto the inside of the concave steel bearing shells. It is only necessary to apply the expensive alloy to about 20 percent of the surface using this technique, compared to 100 percent via the conventional process. 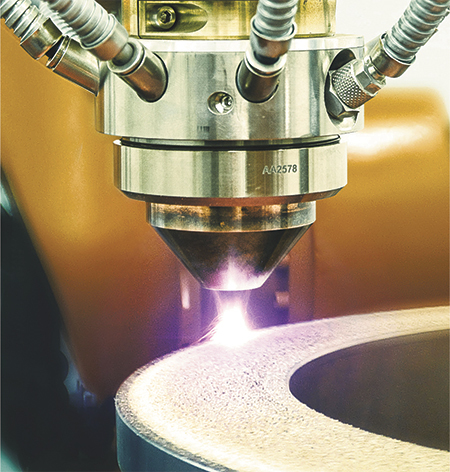 Use of a laser also saves time and energy, since only a small amount of metal needs to be melted in each case. The new generation of additive manufacturing is especially well-suited for bearings that are in constant use, have a large diameter, and are subjected to large bearing forces and high rotational speeds. It also can be used to inexpensively repair defective bearing shells and restore them to a like-new condition.